Download the latest Price Tags here. What do the residents of False Creek North think of living in one of the largest centrally located, high-density, pedestrian and family-oriented mixed-use neighbourhoods in the world? Hardly anyone thinks to ask the people who move in after a project is designed and built. In this case, graduate students at UBC’s School of Community and Regional Planning, under the guidance of Professors Wendy Sarkassian and Larry Beasley, set off to find out how False Creek North is meeting the needs of those who call it home. The good and the bad. 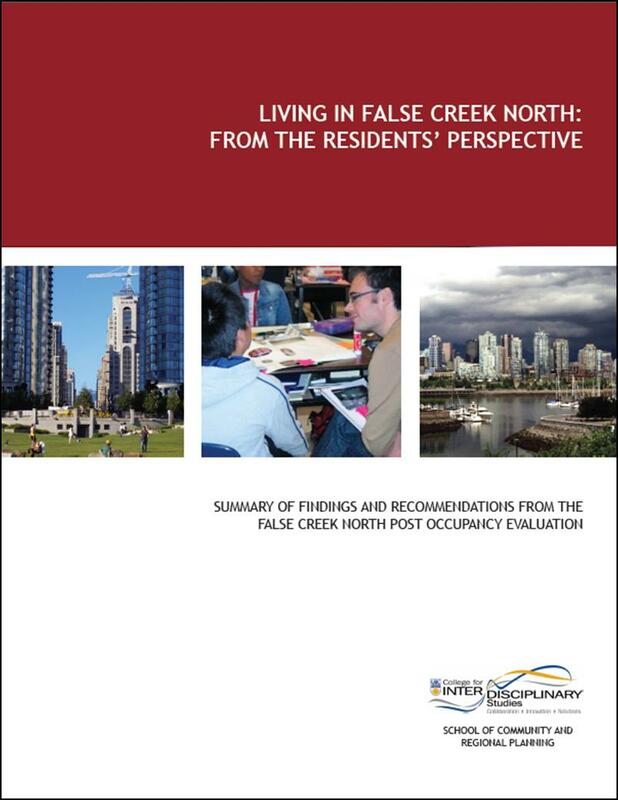 Based on the report – Living in False Creek North – this issue is a summary of their findings, extensively illustrated. But John’s an academic too, and he’s just been published in Transport Reviews. You can download “Making Cycling Irresistible” here. There’s no doubt that False Creek is one of the most admired locations for planned residential communities in North America – from the South Shore project designed in the 1970s, to the South East ‘Olympic Village’ now under construction. But the largest of them all can be found on the North Shore – Concord Pacific Place – as well as some of the adjacent neighbourhoods. But what do the people who live there think? It’s very rare that they’re even asked, once the development is approved, built and sold out. Well, not in this case. Thanks to the work done by the School of Community and Regional Planning at UBC, under the guidance of past planner Larry Beasley and social planner Wendy Sarkissian, we now have the results of a post-occupancy study of False Creek North. The Vancouver Sun summary is here. You can access a copy of the full report here. Christopher Hume, the Toronto Star’s urban critic, was the VIA Architecture Urban Design lecturer for the City Program a few weeks ago. Here, on reflection, are some of the comparative thoughts he had about our two cities. Want a new urban model? Go west. What a great event. Kudos to the SFU City Program for bringing Christopher Hume to Vancouver — he is an insightful and interesting presenter. And truly an inspiration for those of us who write about cities. It’s a testament to his journalism that another Toronto urbanist was also in Vancouver last night for a public presentation (Richard Florida, UBC Robson Square), and that the SFU Cities lecture with Hume had a strong turnout. In my mind, Hume is great because he has a terrific grasp of the issues, a witty but biting style, but also, because he writes for all of us. Plus, I’ll see Toronto in a whole new light when I’m there this summer. I was sent this today and I can only say that it is absolutely brilliant. It’s an hour-long filmed seminar with legendary John Pucher at Simon Fraser University in Vancouver, Canada. I’ve read most of what’s he has written on increasing cycling and making cycling accessible but seeing this seminar online is purely inspirational. Now it’s no secret that segregated bike infrastructure is the only way ahead for cities wishing to increase their bike culture and daily percentage of trips made by bike. There is no alternative to this common sense. Seeing John Pucher summing everything up in one entertaining, informative and inspiring video has made my day. He highlights the experiences of many European cities and debunks many myths along the way. See the film now. Quickly. It’s wonderful. Don’t forget: this year’s VIA Architecture Lecture on Urban Design is coming up this Thursday at SFU Harbour Centre , featuring Toronto Star urban and architecture critic Christopher Hume. Details here.